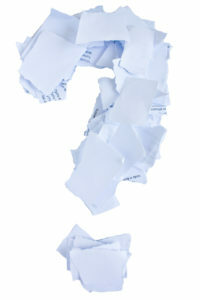 What happens to your documents when you use a shredding service? With the security of sensitive data on everyone’s mind these days, and identity theft on the rise, it is more important than ever for businesses to ensure sensitive documents are securely and totally destroyed. The best way to achieve this is to use an experienced, reputable document-shredding company like Australian Document Shredding Service. So what actually happens to your documents when you use our services? Let’s look at the process from go to whoa. First of all we deliver securely locked bins to your premises for safe storage of sensitive documents that need to be destroyed. Each 240 litre bin can hold up to 100 kilograms of documents. Our service is scalable, allowing you to order one bin or multiple bins, depending on your requirements. You can also choose a one-off service, or a regular service with scheduled pick-ups. Once your bin is full — or on a regular schedule for repeat clients — it is collected and securely transported to one of our destruction facilities. These are “approved sites”, with strict guidelines governing how documents are transported, handled and destroyed. All staff involved in the process of document destruction are cleared with a minimum of a National Police Records Check. Documents are then put through a comprehensive cross-shredding destruction process. This reduces them to tiny fragments. Clients are provided with a Certificate of Destruction, legal proof that all data has been completely and permanently destroyed. Finally, the destroyed documents are transferred to a paper recycling facility, where they will be recycled into new paper products. Not only will you be doing the right thing by your business and your clients, but by the environment as well! As you can see, we take security very seriously at every stage of the document destruction process. To find out how secure, convenient and cost-effective our services are call Australian Document Shredding Service today on 1800 001 008.